Regular viewers of the BBC programme The Great Painting Challenge will know that the amateur artists who take part are set a challenge each week by the programme presenters, and each week one of them has to leave the series. The Great Painting Challenge in Alvechurch has some similarities in that a group of amateur artists are set a particular task – but the main difference is that the challenges are annual rather than weekly, much to the relief of the artists, and no one is asked to leave! 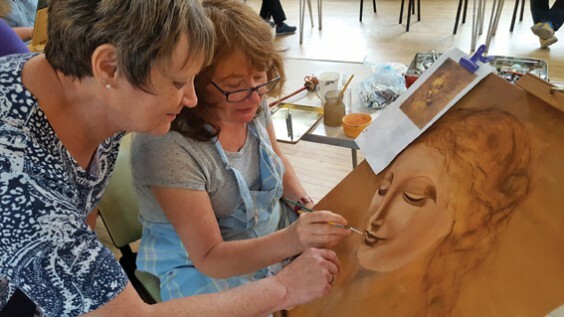 For the past few years, members of Pam’s Art Groups (which meet in Alvechurch on Thursdays and Droitwich on Wednesdays), have been given a challenge by Kamal Khan, owner of Grosvenor House nursing home in Alvechurch and Tutnall Hall near Bromsgrove. Last year the task was to create Georgian-style paintings, but this year Kamal has laid down three totally different challenges. The first was to emulate the Impressionists, started by Monet and other Paris-based artists in the early 1860s. Impressionism was based on painting “en plein air” (in the open air) rather than in a studio based on sketches, although the paintings that will be on show in July have all been painted indoors! A second option was to produce a painting in the style of Leonardo da Vinci. One of the local artists, Di Morgan, who has already created a large painting of an angel in that style, shares her birthday with the great artist – albeit nearly 500 years apart! The third option, which was a more difficult concept, was to produce a work of art representing Mozart, using musical instruments within the picture. The winners of this year’s challenge will be announced and displayed at Tutnall Hall’s Summer Fete on July 21, and Kamal has invited Bromsgrove MP and Home Secretary Sajid Javid to award the prizes. The challenge entries, together with up to 100 other original images, will then be on view in Alvechurch Village Hall for the annual Art Exhibition from July 26 to 28. Many will be for sale at prices that should make them attractive investments, especially as purchasers will be able to buy a work of art that no-one else owns. Previous exhibitions have received excellent reviews by visitors and the intention is always to improve on the standard of work. So all pictures in the main exhibition will be art that has not previously been exhibited and that has been created during the last 12 months. Above: Pam McGregor advises Barnt Green-born artist Alison Collis.